I recently wrote an article about the potential health concerns with the alternative food industry on my blog here. While I believe alternatives are great temporary substitutes if you have food intolerances and allergies, they should be consumed in moderation because after all, most store-bought dairy alternatives are technically a processed food. Instead, I always encourage people to eat foods in their most natural state whenever possible in order to help support and maintain gut health. Food intolerances generally stem from a dysfunction of the gut, which can be attributed to eating foods that are not in their proper form. Take dairy for instance, our intolerance to dairy is often attributed to years, generations even, of consuming milk from cows laden with antibiotics and hormones. In addition, milk is highly processed and heated which destroys nearly all nutrients and health benefits. Consuming dairy in this form (along with other contributors) over prolonged periods of time can cause the gut lining to weaken and become permeable, allowing undigested foods and toxins into the system. When dairy passes into the system through a leaky gut, the body recognizes it as foreign and amounts an attack, causing a food intolerance. This is why it is important to not blame dairy for digestive complications, rather, ensure you are consuming foods in their proper form while also working towards healing the gut lining. Because it is difficult to find dairy in its most natural state, without the use of hormones and antibiotics and as minimally processed as possible, I have found camel milk to be extremely helpful. Camel milk reminds me of bison when it first became an alternative to beef—it was sort of an untapped industry where the animals were nearly entirely grass-fed and grazed on open pastures. Corn-fed and conventionally raised bison was almost unheard of. Likewise, most camel milk originates from hormone and antibiotic free camels consuming a natural diet. Because these animals are more “wild” in a sense and have never been factory farmed or raised, they don’t have the negative effects of the degeneration of health implications like cattle and therefor tend to be a healthier source for dairy. Although most camels graze on grass and are raised in humane environments, it is still important to ensure you are sourcing the best quality milk. I was so happy to have met Camel Milk Coop, an incredible source for clean, sustainable camel milk. They source their milk from small Amish farms in Missouri where quality and sustainability are important values to the families and community. Camel milk offers incredible health benefits, most notably its support for gut health and its ability to help promote the healthy species of bacteria. Plus, similar to goat’s milk, camel milk is easier on the body to digest as it is the closest form to human breast milk. In fact, camel milk is free of β-casein and other common allergens which are thought to be the cause of many health complications from cow’s milk. Camel milk also has anti-fungal and antiviral properties as well as anti-arthritic properties. It has also been linked to reversing diabetes and even autism. Camel milk hosts countless other health benefits like rich in antioxidants that have been known to reduce symptoms of cancer. It also has anti-inflammatory properties that can be helpful in treating autoimmune conditions like IBD. Camel milk also has amazing healing benefits for the skin as research shows it has helped skin disorders like dermatitis, acne, psoriasis, and Eczema. You can read more about the health benefits of camel milk here. I noticed a huge difference myself after consuming camel milk. I had no digestive issues or any complications as a result from consuming it and even noticed the complete opposite effect--improvements in the clarity of my skin and less bloating and digestive issues. Plus, when I used camel milk in my morning coffee, I felt like I had more sustained energy throughout the day and the coffee was more easily absorbed into my system. Camel milk tastes a bit like goat’s milk but not as pungent so I feel like it is easier to drink without an overbearing taste. I found it was easy to add into coffee, smoothies, and even make my homemade yogurt with! You can order camel milk from Camel Milk Coop fresh or frozen. Because of camel milk’s unique proprieties, you can freeze the milk which is great for shipping and storing. 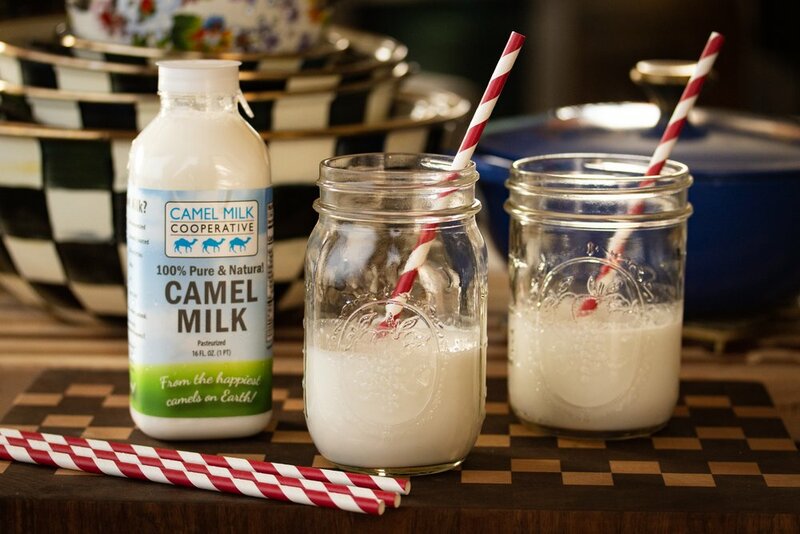 Be sure to check out my friends at Camel Milk Coop for more info and use code “fairygutmother” for 10% off your purchase! As always, I encourage everyone to try to stick to consuming as many foods in their most natural state as possible in order to support optimal gut health. Have you tried camel milk? If so, what did you think? I’d love to hear your experience on how it has helped you!